Shower curtains have the capacity to make or break a bathroom, which makes them one of the most pivotal decisions when furnishing your home. From playful patterns to calm color palettes, it can be a long road to find the perfect fit for your space (and your roommates). Luckily, like anything decorative, there are a few top trends emerging that can point you in the right direction and make the process a whole lot easier. Check out the trends you can bank on in 2019, below. 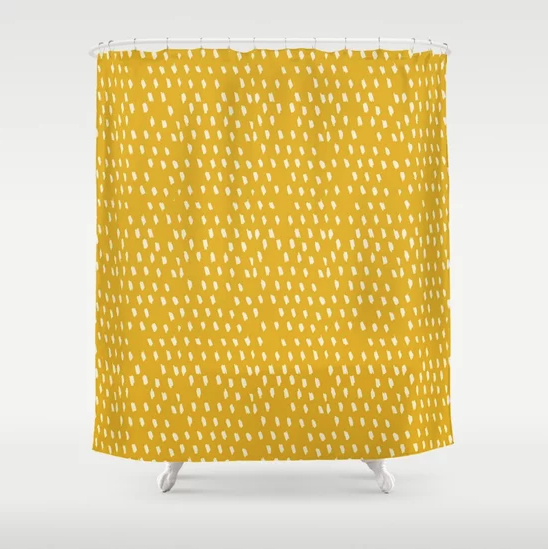 Shower curtains have long-since been the most innocuous bathroom feature, with households generally opting for mild simplicity such as stripes, checkerboard patterns or worse: plain white. Well, no more. An eye-catching curtain will brighten up a space and guarantee compliments from guests. 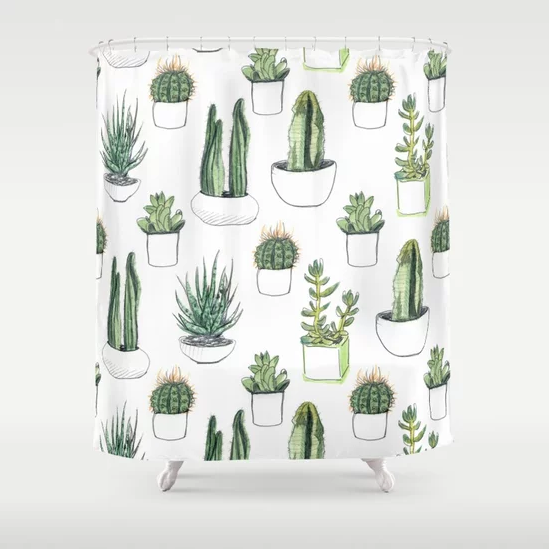 Go a step further and turn your shower curtain into a work of art with designs like these. Trust us, the future is bright. Transport yourself to a tropical paradise with a plant-themed moment. Nature brings tranquility to any environment, so you might as well take the opportunity to go full-throttle with succulents, florals and ferns throughout your bathroom. Use this curtain as a decorating springboard for the rest of the space — consider stringing several maiden hairs from your ceiling, position a potted plant by the entrance or a baby cacti on the sink. Remember, there’s no rule book stating your bathroom has to be anything less than a conservatory. We know what you’re thinking — your home is a sophisticated oasis, and jokes have no place in your bathroom. While that’s completely understandable, frivolity can still be chic, as demonstrated by this curtain starring a luxuriating Barbie in the bath with a bottle of wine. Your shower will show off your quirky personality, and, in the age of millennial pink, you can rely on any pastel palette to be both soothing and stylish. Retro-inspired designs remain the most reliably-fashionable choices across apparel and interiors, which means you won’t go wrong embracing vintage in your bathroom. There are more subtle references to popular patterns of the past, like this 60s-inspired monochrome item, or more overt, like this print from the 1970s. Then there’s a mixture of the two. 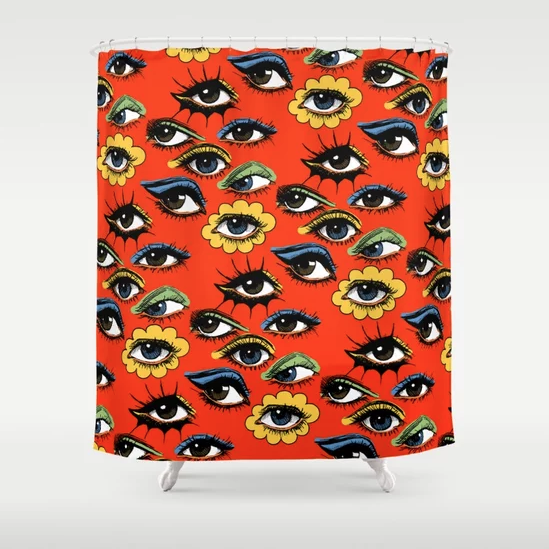 If want to embrace nostalgia and aren’t afraid of a little vibrancy, this mod curtain, complete with pop-art styled eyes, is absolutely for you. 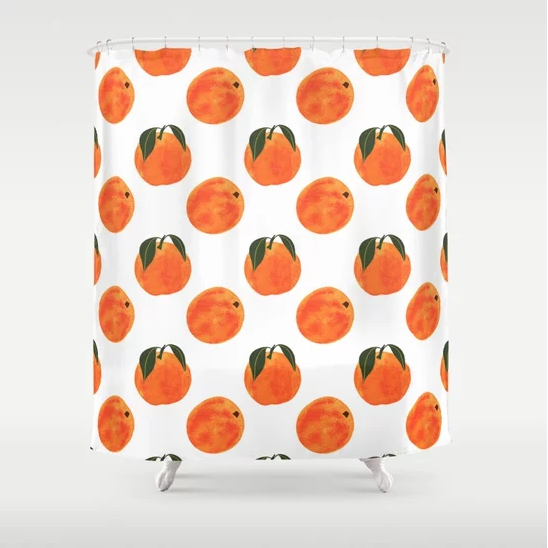 There’s nothing fresher than a fruit design — be they berries or bananas, the tasty treats dominate runways and can be an exciting update to your apartment. Wake up and smell the citrus with these oranges, or even opt for avocados. This simple lemon curtain is also one to be bookmarked, and let us not overlook the cultural significance of peaches post-Call Me By Your Name. Whichever natural snack appeals, fruit can elevate any mood, or room.